Your commercial facility may need a generator and custom louvers to go with it. Blackouts and power outages often leave business owners and managers unable to conduct normal business operations. Especially when severe weather is to blame, these events are not something that can be controlled or stopped. It can result in a loss of productivity and revenue. However, having a generator in place is a great way to keep things moving, even when electricity has failed. Here are the reasons why you should invest in a generator for your commercial facility. Severe weather is the most common reason for power outages. While these events can’t be stopped or controlled, you can keep an eye on reports when hurricanes, tornadoes, and thunder storms are expected. In addition to weather, other damage to power lines and power grid failures could and will also cause a power outage. Ultimately, preparation is the best way to address this issue. Get proactive in protecting your business by investing in a generator. Before disaster strikes and you’re left with no options, you should invest in either a natural gas or diesel generator. Regardless of the type of commercial facility you operate, one of these types will provide power to your space for the short term and can be extended for long-term use. 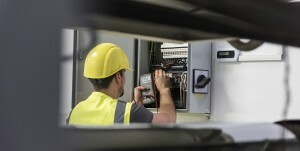 To get the best advice about what your facility needs, you should consult an electrician who can test your load and provide a report of your usage data. An Automatic Transfer Switch will monitor your utility power and during an outage, transfer power from the utility to the generator. Because it’s automatic, when power to the utility is restored, the transfer switch transfers back to the utility and shuts down the generator. An uninterruptible power supply could also be used for short-term outages. Once you have the generator in place, it should be maintained and tested regularly to ensure that it remains in working condition, especially when you need it. You wouldn’t want to get caught in a power outage situation and have a generator that doesn’t work. Occasionally run the generator so that it doesn’t ever sit idle for an extended period of time. Furthermore, have a fuel storage plan in place so that you’ll always be prepared to refuel your generator. This entry was posted on Friday, April 13th, 2018	at 2:35 pm	. You can follow any responses to this entry through the RSS 2.0 feed. Both comments and pings are currently closed.